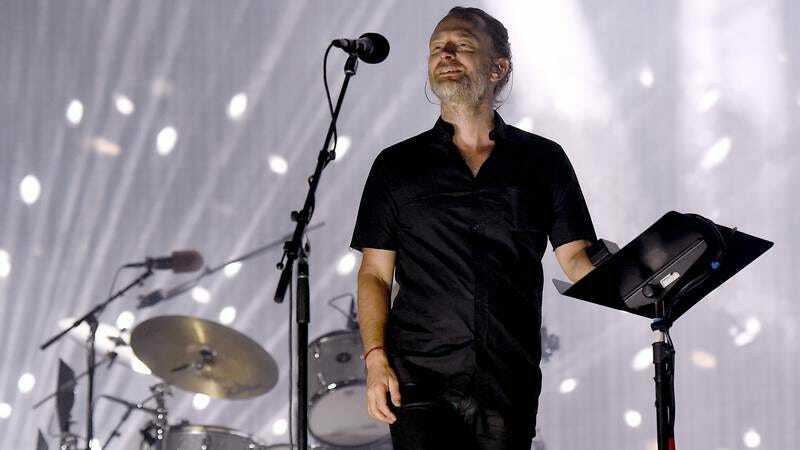 He’s no Goblin, and we’re not just defending the guy’s appearance: It’s been announced that Radiohead frontman and sentient conception of “ennui” Thom Yorke has been hired to score the upcoming remake of Dario Argento’s Italian horror classic Suspiria. The film, which moved from “ghastly idea” to “let’s give it a shot” when I Am Love director Luca Guadagnino and his A Bigger Splash cast (Tilda Swinton, Ralph Fiennes, Dakota Johnson, Matthias Schoenaerts) signed on to the project, is about a young American woman who travels to 1977 Berlin to join a dance company, only to suspect it may be hiding a dark secret. In that respect, it’s the perfect project for Yorke, who already looks as though he’d like to time travel to 1977 Berlin and lounge around the back room of a languid salon, giving readings of Thus Spoke Zarathustra and drinking absinthe. This will mark the first time the talented musician has scored a feature film, perhaps because he got tired of Johnny Greenwood walking into the band’s practice space and saying, “Oh, right—this ‘rock music’ thing,” with a bemused chuckle. Still no release date for the film, but this news does give us another opportunity to marvel at what Tilda Swinton looks like in this movie, which is if a wizened Yertle The Turtle received his deathbed wish to become human.